Jarvis’s rejected sleeve notes from the “Masters of the Universe” compilation, 1994. 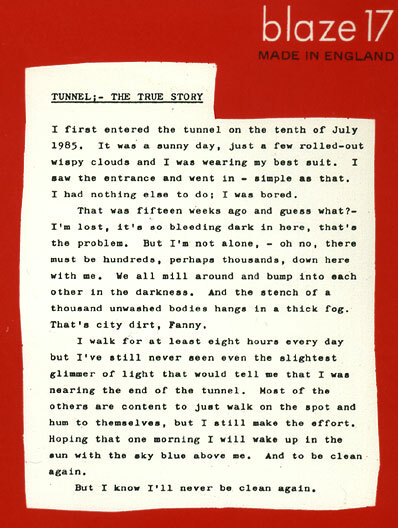 As strange as it may seem, ‘Tunnel’ started out as something of a pop song. Admittedly, this was only within the context of a famously shambolic late 1984 Pulp gig, set among the morbid and the painful, but it’s still very odd to hear. The bass riff is much more playful and melodic, and Magnus seems to be playing a brushy post-punk-jazz fill throughout. The song is much faster, half the length of the recorded version, and instead of echoed announcements Jarvis has dusted off his punk yelp. Most vitally there is no breakdown, no wall of noise and violence, but the song itself is still there, somehow, though lacking the reference to the 10th of July 1985, of course. Then the band, for whatever reason, left the song to fester for two and a half years, digging it out at the tail-end of the “Freaks” recording sessions. In a week full of misfires, fudges and rush jobs, it’s the only track that really blossomed in the studio environment. After it had been laid down, Russell commented that “the muse was with us” – and not without reason. The success of the recording was, however, at the expense of the future of the track, the finished eight minutes being very much a studio product, and not reproducible in a live setting. Once again form reflects subject. 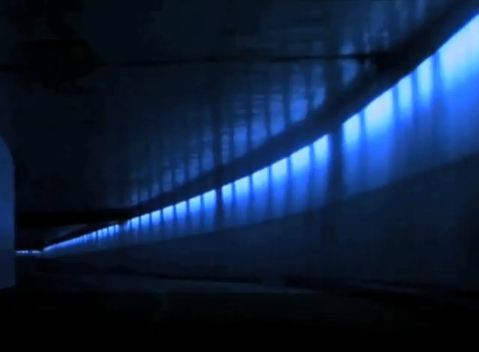 The track (never has the word been more apt) feels like a progression through a tunnel, though (spoiler) we never get to emerge from the other end. We enter along Manners’ locomotive bass line, pounding drums emerge, battering you from left and right, their rhythm jarringly out of step until suddenly everything slots together. Soon words emerge, like megaphone pronouncements from a crumbling communications room, the announcer asleep, or undergoing some kind of schizophrenic breakdown. Then, crashing walls of distorted guitar. We move through several sections, the insanity building each time the rhythm shifts. Finally we descend into fiery chaos, backward sounds wailing like trapped animals with seemingly random flashes of noise and melody including misplaced surf rhythms coming in like radio interference. What we have here is more than a bad trip – it’s the unreliable narration of a fall into hell. Of course, there are plenty of people out there who don’t like “Tunnel” – Pulp fans, music reviewers, people in general…. Reviewers on Bar Italia (presumably some of the keenest fans of all) described it as “pointless, rambling, horrible, crappy drivel” and “over-indulgence of the worst kind.” When I first heard it on the ‘Masters of the Universe’ compilation in 1995 I remember universal disapproval from friends and family. It’s clear then, that my love of the song puts me in a tiny minority, and sometimes I even doubt myself. Is it just nostalgia for the piece that introduced me to the world of discordant, experimental music? On balance, I honestly still feel not. It’s a powerful, original piece of work, and comparisons to Joy Division or other post-punks does nothing to dilute this. Why? Because it’s not a pastiche – it’s real. How did Jarvis write the lyrics to ‘Tunnel’? The greatest influence seems to be film noir and the twilight zone, but there’s also a section that reads like cut-up poetry – an effective simalcrum of a schizoid mind. 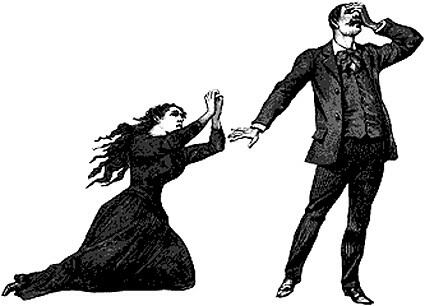 The protagonist is clearly disconnected from clear thought and speech – he keeps going off at odd tangents and being distracted by disconnected thoughts. The passion excuses the opacity, which in turn excuses the strangeness. This is also the first sighting of “sunlight through net curtains” – a premonition, perhaps. It would be four long years until the group put out another record, but that’s a whole other story. Being an artist is often analogous to being an attention-seeker, and that’s probably why brashness and energy are essential for anyone seeking a career in music. There are very few musicians who would like their work to be described as “soporific” – making your audience switch off and drift away is exactly what they’re trying hard not to do. There is ambient music, of course, but that’s off in a world by itself. For gigging bands, playing in noisy bars in front of drunk people, the temptation must always be to get faster and louder. “Goodnight” was never played live, of course. How could it be? A concept piece that sounded like falling asleep would be unlikely to go down well with even the more sober late night punters. Instead it’s something of a studio creation, reliant on subtle production tricks and atmospherics, created as a low-key closer to the ‘Dogs Are Everywhere’ EP. Descriptions of the deserted night-time streets of the city are fairly commonplace by this point. The innovation here is the introduction of the intimate spoken-word narrative. It’s a vital element in the band’s sound for the rest of their career, and for good reason. Limited as he was as a crooner, Jarvis has always had a sonorous, authoritative timbre to his voice when speaking, and the freedom gained from abandoning the structures and conventions of singing allowed him to present much more vividly realized material and play with the natural cadences of his voice rather than be constrained by it. For the first half of ‘Goodnight’ he guides you gently back home to your house before lulling you to sleep. Instruments start to fade in – first organ and then a beautiful dulcimer backing. Both sound like they are guiding you to heaven. Meanwhile an odd counterpoint chorus pops in and out, like a dark thought niggling at your subconscious – something’s not quite right. The imagery becomes increasingly hazy until “there’s something you’ve forgotten” and we launch into the now-customary nightmare sequence, a panic that if we’re going to heaven then – of course! – that means leaving life behind. This nightmare is thankfully less jarring than usual, the backing continuing to increase in intensity, but not launching into a different tune. Jarvis is singing again, but his vocals have been treated to sound resonant and metallic, and are mixed low enough to avoid the silliness of ‘Master of The Universe’. ‘Goodnight’ is in its own quiet little way a bold leap forward. It would’ve been nice if Jarvis could have gone with the concept, trusted his speaking voice to carry the entire track (instead of launching into an ill-advised whispered version of his croon on the choruses) and not felt the need to add the usual gothic doom to the conclusion, but for a couple of minutes at least we really have something rather special. 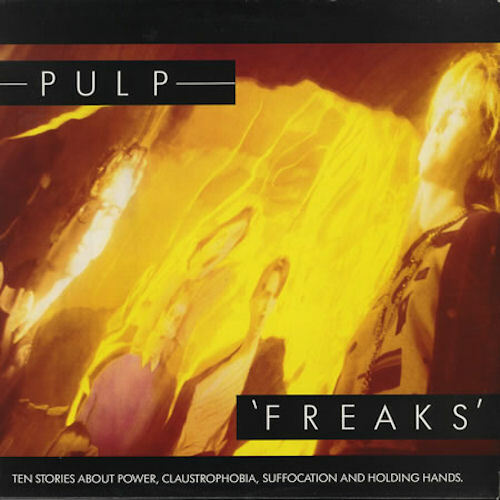 Listening to Freaks-era Pulp can often be a frustrating experience. With a little patience you can tell what they were aiming for, but also that they were following a blind trail up a dark alley. Jarvis’s deep sixties croon, Russell’s out-of-tune violin, tortured borderline-pretentious lyrics about death and perversion… It all simply wasn’t going to work, and comparison with their 1990s work shows that a different approach was needed. But then Being Followed Home blows this idea out of the water. Suddenly everything works perfectly. In part this can be attributed to a level of professionalism above and beyond anything else on the album. Every note is well-chosen, every line well-crafted, Jarvis’s flat baritone slightly raised and steadied, the violin subtlety used to recreate the sudden jolts of a rising heartbeat, the lyrics well-crafted. An unmatched amount of talent and work are evident throughout. Thematically we’re not exploring new ground. Paranoia, dream narratives, journeys through the city at night – these have been common themes throughout the band’s career* – but here they are tied together perfectly. 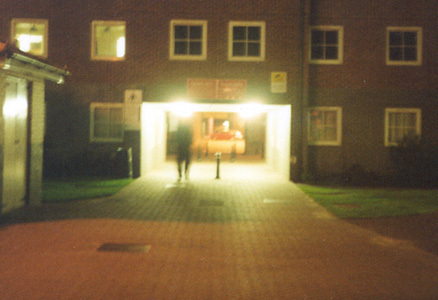 The title is the catalyst – is there any fear more primal than being followed by a malevolent force at night-time? England can be a surprisingly scary place, especially at 3am on a Sunday. The clubs have closed, the crazies are out, and all you can do is keep your head down, avoid eye-contact and keep walking – quickly, but not too quickly. Freaks tend to draw attention. Cities are places where you can blend in, but when all the regular people have gone home to bed your cover is blown. Other people are walking the same route; are they harmless, just making their own way home? Or are they following you? It’s a familiar situation, but Pulp manage to take it to new places. This is not so much a song, more a treatment for a post-punk-opera. In fact it’s cinematic enough that it sits in the part of my memory usually reserved for short films, and possessed of a very odd ABCBCDBA sequence taken from the realms of 15-minute prog-rock epics of the early 70s. We start with echoey footsteps taken from Jarvis’s BBC sound effects LP, a low-key but determined guitar line, he mutters under his breath that he’s being followed home, and then the second guitar line comes in with a sudden jolt in tempo – a quickening step to test whether he really is being followed. As he walks he’s distracted by vivid memories from his recent past, a failed affair – he’s clearly still in love, obsessed by a supposedly indelible memory of this woman – but something has gone terribly wrong and he’s left her forever. This would usually be the part to jolt awake from the nightmare, but instead he “awoke on a beach sometime later to a grey and sunless sky.” (this has to be one of my favourite Pulp lyrics of all-time) – he’s beaten and bruised, but now his memories of the beating and the romantic disappointment are all mingled and confused. The world has conspired to batter him from both sides. We return to the early verses, but now as a series of grizzly flashbacks – the other kind of indelible. But time can heal everything – his wounds begin to heal, and his memories begin to fade. The handprints in the sand that “would last forever” have been swept away by the sea – he’s forgotten the fear, but also the passion. There’s a sense that all of this is a metaphor, but a literal interpretation seems equally valid. No matter what personal triumphs or tragedies are fresh in your mind, the world can be a cruel and random place. As the track finishes we return to the start. A recurring dream? A repeat? Or a memory that won’t go away? He’s being followed home.